I have perused your formatting advice and have a question. You advise underline to indicate italics, what about bold? Make it "actual" or use asterisks, etc? I need to indicate vectors in bold for a fact article but for sci-fi geared magazine. Thanks. The use of boldface type is rare enough (at least in the fiction world) that, back in the olden days, one had to indicate it by hand by drawing a squiggly line underneath the words to be bolded. For whatever reason, our society has adopted italics as the preferred method of emphasis, which is why underlining is a function readily available on most typewriters but undersquiggling is not. I have a contents page after the main title page, so I want to start the page numbering on the third page, which is where chapter 1 starts. Have tried everything but can't seem to do it  any ideas? This is a question that could be answered a few different ways. My first (and least preferred) answer is to refer you to my post "Page Headers for New Chapters," which contains tips about suppressing headers on certain pages. (Basically, if you're using Microsoft Word, you set a section break at the end of the table of contents and then create your header on the first page of your first chapterthough there's a bit more to it than that.) This is a fairly complicated option and is only recommended if you're a very determined power-user of Word. My next (and slightly more preferred) answer is that you simply allow the table of contents to have a header and be numbered as page 1. The title page of your book manuscript is the only page that shouldn't have a header. If you include a table of contents, then it's fine if your first chapter starts on page 2. Page numbering is not done for aesthetic purposes; as I repeat over and over, it's a functional marker that allows a dropped manuscript to be reassembled in the proper order. I just wanted to know if you still include a header on the first page of your chapters, and if you still use Courier 12 in your manuscripts - as shown in your venerable novel manuscript format example template? Is there a way to set headers to recognize the first page of chapters, and delete headers from these pages, if we wanted to? To answer your first question, if I didn't still format my book manuscripts that way, I wouldn't still format my sample novel manuscript that way. What you see on that page is what I still do, and what I will continue to do until I see a compelling reason not to. And speaking of compelling reasons not to, why on earth would you want to eliminate page headers from the first pages of new chapters? For aesthetic reasons? A book manuscript is a functional document. It has a job it needs to do, and part of that job is to have a header at the top of every page. The manuscript is supposed to be a blueprint for the finished product, not to look like the finished product. Just because published books usually don't have headers on the first pages of chapters doesn't mean the same should be true for your manuscript, no matter how weird it looks to you. Please could you explain how, using MS word, I can use a header like the one on your manuscript of The Normal Guy? Each time I try it will only let me have EITHER the name of the book OR automatic page numbering, not both. I suspect the problem you're having is because you're trying to create the header and set the page numbering separately. when they need to be done together. Follow along with the steps below and we'll get it straightened out for you. [My question] regards major and minor scene breaks. I understand that one sets off a blank-line break with #, but what about a more significant scene break, the sort one usually sees in print marked with a blank line, a divider (often three asterisks, centered), and another blank line? Is it as simple (and aesthetically unappealing) as placing # signs in the blank lines? Or does one leave the blank lines blank in this case? The answer may be blindingly obvious to everyone but me, and if so, my apologies for troubling you. But I find both options to be less than pleasing to the eye, so if I'm going to inflict one on an editor, I'd much rather inflict the right one. An excellent question. I think we've all seen major scene breaks like the ones you describe in published bookssomething less than a chapter break but more than an ordinary scene break. Sometimes they might be rendered in a book as several blank lines followed by an unindented paragraph with the first several words in bold. But how should one render this super-scene break succinctly in a draft manuscript? Can my word processor insert two spaces automatically? Quick question - as a new/aspiring writer, starting a manuscript, I'm curious to know if *you know* of a way to make it double spaced after each sentence. I'm used to writing documents that have only one space between sentences, but I perfectly understand the need for two for a submission manuscript. Any tricks you've found with Office Word that make it automatically two spaces for a single hit of the space bar? I'm not aware of any feature in Word, or in any other word processor, that would do what you want. Most word processors can easily be set to perform the opposite conversiontwo spaces collapsed automatically to onebut determining where the end of a sentence falls is a very tricky programming problem that would fall prey to frequent errors. More to the point, though, why on earth would you want a feature like that? Yes, two spaces after a sentence are still acceptable in most manuscript submissions, as I've endlessly argued, but that convention is quickly going the way of the dodo. If you're not already in the habit of putting two manual spaces at the end of each sentence, there's no reason for you to go out of your way to do it. Stop worrying about spaces and just focus on your writing. I'm preparing a manuscript for a children's book. Should I use the same format [as for adult fiction]? Or is there a different format for this type of book? Yes, when submitting a picture book, chapter book, or other work of children's literature, you should use the same format you would when submitting any other book manuscript. If the book is to be illustrated, your publisher will most likely recruit the illustrator for you. For much more detail about the kinds of children's books out there and how to sell them, consult a book like The Complete Idiot's Guide to Publishing Children's Books. It will have far more useful information on this segment of the publishing business than I can provide. Quick question: which font do you use when writing a manuscript - Courier New or Courier Final Draft? Good question, though those two fonts are hardly the only Courier variants available to choose from. One could also try Courier10 BT, Courier Std, Courier Stylus, Dark Courier, and no doubt many others. But you asked which font I use. It's Courier New, but that's really only because it's the default Courier font that comes with Windows. Courier New prints a bit light and thin for many people's tastes, so if you have Courier Final Draft (which comes included with Final Draft screenwriting software) you're probably better off to use that instead. It's a somewhat heavier and darker font than Courier New, and it looks better printed. When is a scene break not a scene break? I am a bit confused about scene changes. I know that they have to be denoted by a single line with a "#", but if I use them at every scene change my plot will "unglue" a bit. There is something a bit Proustian to the flow of my novel that I don't want to interrupt, and the only breaks that I want are those between chapters. For example, suppose the protagonist is writing about his home. Then he starts to reminisce about another era, when he lived in a much poorer home in another country. From everything I have read online, it seems I'd better note this scene break between his actual home and his subsequent reminiscence of the old residence; but I feel something of quality will be compromised if I do it. Should I do as I wish with little fear of making some agent raise his eyes towards heaven, or should I be punctilious and proper and leave a blank line with the # at every line change, irrespective of how I feel about it? You are under no obligation to indicate a flashback or other shift in time or space with a scene break. A scene break is simply one of many stylistic tools you can use to make such an indication. If you feel that an uninterrupted flow is best for the effect you want to achieve, then that is perfectly fine. If you do your job properly, then the reader should have no trouble following the change whether or not you call attention to it with a skipped line. Back in January, Slate's Farhad Manjoo set the blogosphere a-boil with a vitriolic philippic against the evils of ever placing two spaces at the end of a sentence. A veritable Greek chorus rushed to add its voices to his, including no less a figure than John Scalzi. On the flip side, Megan McArdle of The Atlantic spearheaded the opposition, and a flurry of spirited defenses of the two-space tradition set out to demolish the arguments at the center of Manjoo's emotional diatribe. I stayed out of the fray at the time. I've already had what I hoped would be my definitive say about sentence spacing, and in fact I spent a lot of time last year thinking through some significant ameliorations of my former strict insistence on two spaces. It was never my intention, back in 1995 when I first posted "Proper Manuscript Format" on the web, to become a de facto formatting guru, but it happened anyway. This means I still get frequent emails from aspiring writers who want to know why this authority or that is telling them they should never ever, on pain of banishment to editorial hell, put two spaces after a sentence. It's probably past time for me to expand further on my position that, while one space is fast becoming the reigning standard, it's still perfectly fine to use two if that's what you prefer. We are all by now familiar with the argument that the two-space rule is a relic of the typewriter era, outmoded in these days of computer typography and proportional fonts. I am willing to admit this, to a point (even as I am unwilling to unlearn a practice that, through more than three decades of dedicated typing, has become as much a part of me as my two thumbs). But where this argument falls short is in its failure to recognize that the commercial publishing industry, at least in the U.S., had already begun phasing out the two-space rule sixty years agoat the very height of the typewriter era. It wasn't the advent of the personal computer that made the practice begin to change. 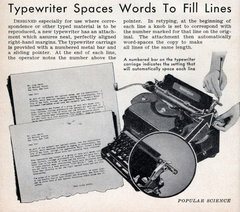 It was much earlier advancements in high-volume mechanical typesetting.